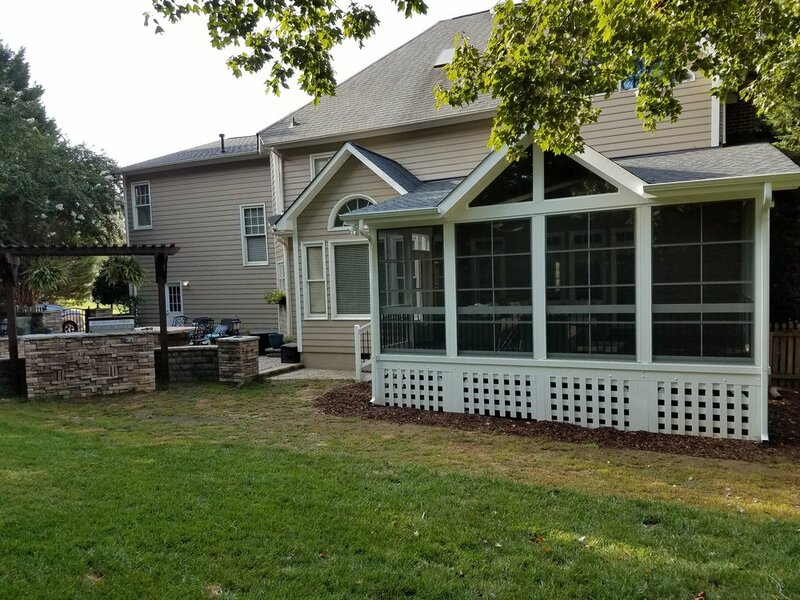 Deckscapes designed and built this porch in the Davidson, NC area. 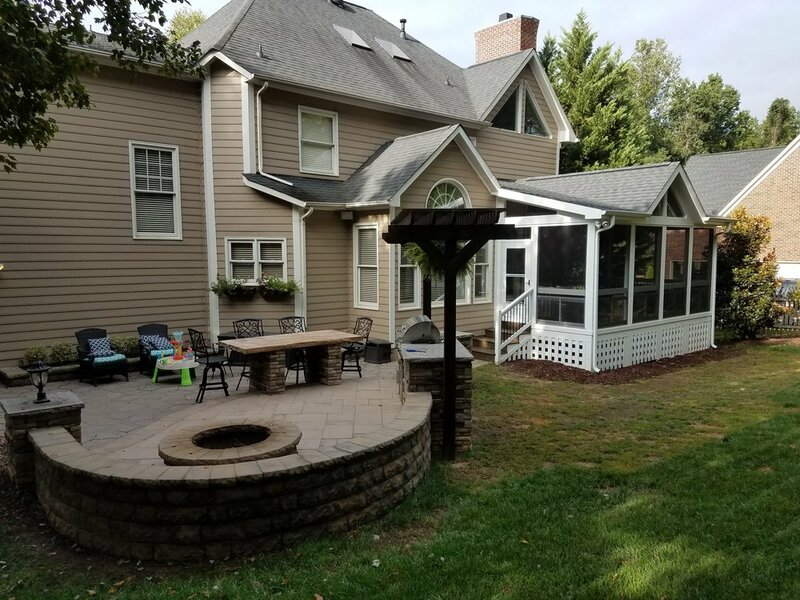 We worked closely with the homeowner to understand what they were looking for in an outdoor room and how we could work together to accomplish their vision. The floor of the porch is 5" Tongue and Groove treated pine decking. It was stained with a Sherwin Williams oil based stain to match their interior hardwood flooring. 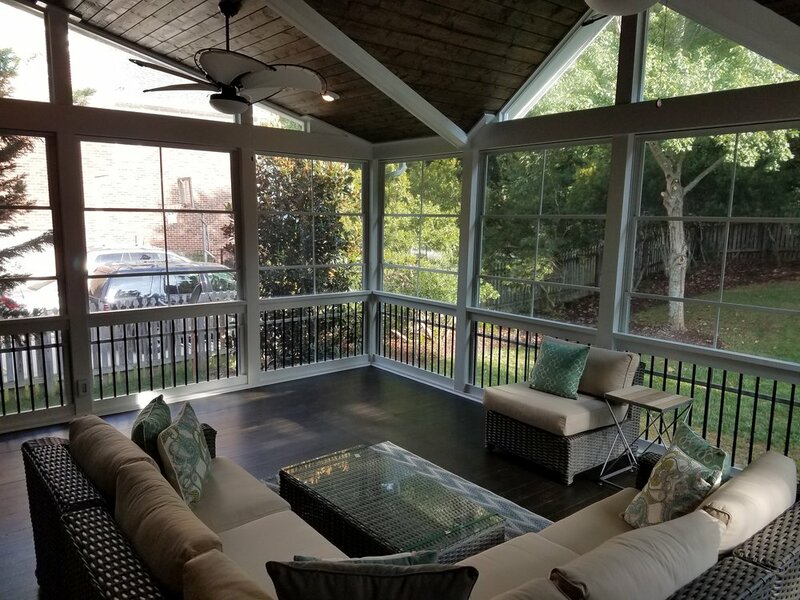 The porch walls are constructed with 6"x6" Cox laminated columns and a 2x6 mid rail along with black, round aluminum ballusters. 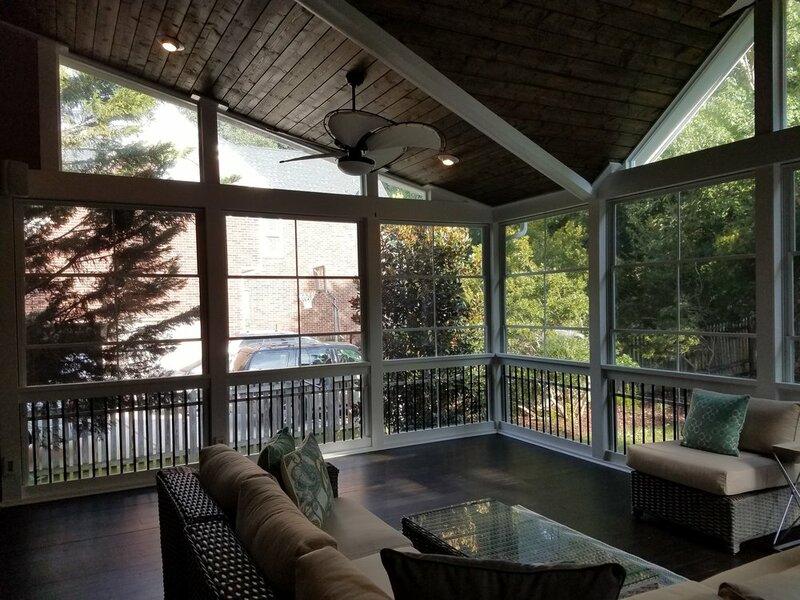 EZE Breeze vertical 4 Track porch windows in white frames and charcoal fiberglass screens were added to the exterior along with glass window panes in all the gable areas. 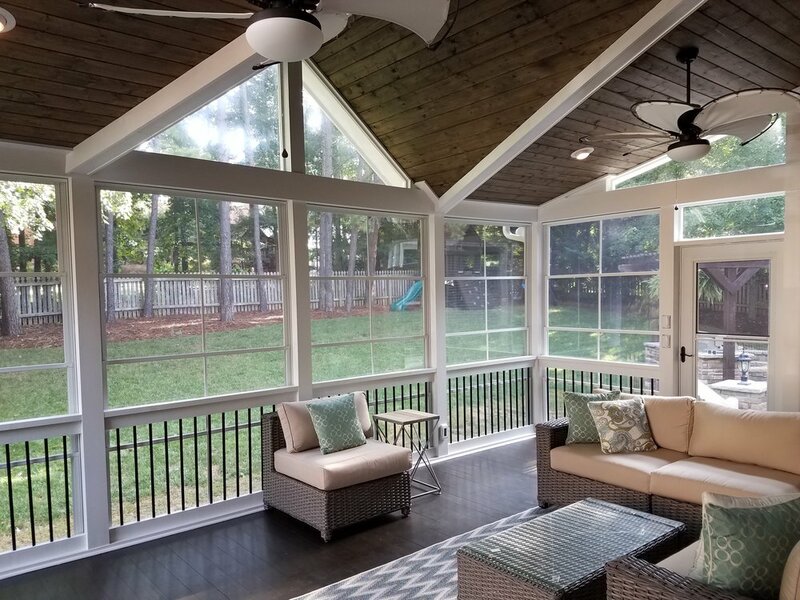 The porch roof is a shed roof design with an open gable in the center. This makes trimming the ceiling slightly more difficult but really adds to the look and openness of the room's final feel (plus we love the way it looks when completed). Recessed lighting (6 cans) and 2 Hunter ceiling fans were added to the ceiling. A dimmer switch was added to the lights to really give the room some ambiance at night. The ceiling was finished in a Sherwin Williams semi transparent stain and the walls were painted white to match the house exterior trim. 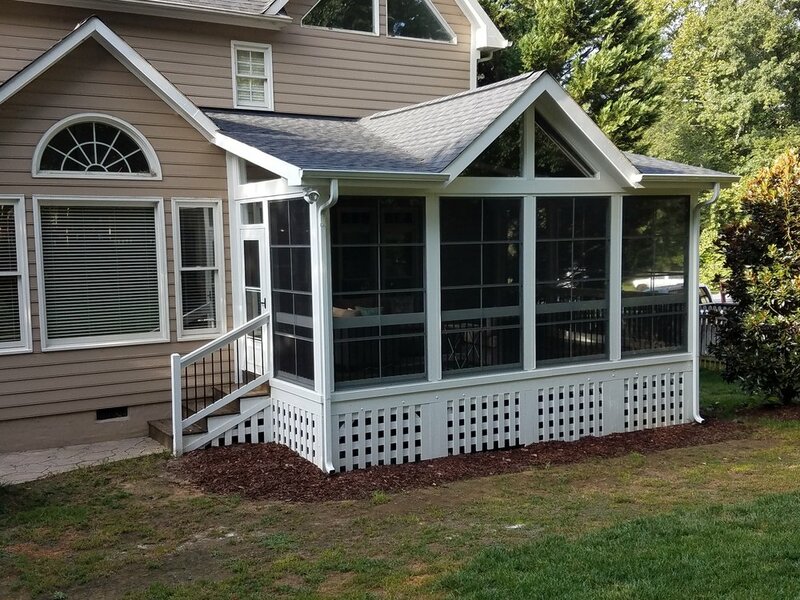 To complete the final product we added a 1x4 English lattice around the perimeter and painted it white to match the porch. We added some speakers inside the porch and a 36" Larson Savannah storm door from the stairs down to the paver patio. After the room was tastefully decorated by our clients I know that they will really Enjoy Being Outside.